A new year and new things for ZXAA! Coming off the award winning year for ZXAA-Outstanding Alumni Association 2011-we continue to be active and communicate with alumni. I wanted to provide an update on events and ZX. The ZX colony continues to impress and work towards chartering this Spring. The chartering process is difficult and requires a day to day commitment. They have completed everything necessary to this point and are on time to charter this Spring. Jay Nicholson is the Alumni Advisor and continues his leadership with the colony. As I have said, they are an impressive bunch and hope everyone has an opportunity to spend time with them. More will be coming to you as the chartering nears. They are expecting a successful Spring RUSH with a goal of 25. Zeta Chi Alumni Association (ZXAA) Housing Corporation is officially in place. Baxter Hall Properties (BHP) is currently seeking a house to rent for the colony/chapter for the Fall semester of 2012. I think everyone will agree to the importance of a house for ZX. A requirement of the colony is no charter, no house. Mac Humphries is the President of BHP and we need to thank Mike Cully, Gary Burgess and Mac for getting Baxter Hall Properties in place. Board Members of BHP: Mac Humphries, Mike Cully, Tim Nichols, Phil Robertson, Ken Schwab, Mike Dailey, Todd Branson, Jeff Layman, Gary Burgess, and Jim Roebuck. Dues come out each year on March 1. This year, by popular request, we will add the option of automatically renewing your dues each year by credit card. You complete this once and forget about it! This will be a PayPal option you select and each year on March 1 your credit card will be charged $50. Dues are the only source of income ZXAA has and your support is needed each year for continue success. The other options for paying dues will continue. My address: 1021 E. Harrison St. Rm 302, Springfield, MO 65807. The colony will host several colony/alumni events this year. Dates scheduled are February 13, March 1, April 9, 2012 from 6-8 pm and will all be held at Ebbet’s Field South, 3662 S Glenstone Ave, Springfield, MO 65804. The colony is charged $200 for the event and all food and drink during that time comes off the charge. Alumni should stop by and have dinner, drink of choice, on these nights with the colony. There will also be give away items! As with all our events spouses and others are welcome. As always, update your information in the directory if it has changed. Follow ZXAA at www.zetachipikes.com and on Facebook: Zeta Chi Alumni Association. The colony is on Facebook: Missouri State Pikes and Twitter. 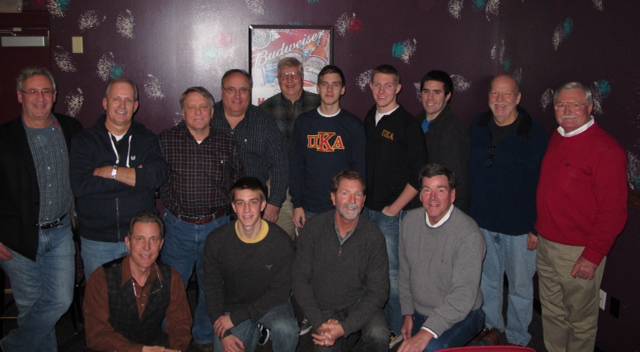 On December 26, 2011 in St. Charles, Missouri, Zeta Chi Pikes of all ages, including four Colony members, met during an annual gathering of St. Louis area Pikes. For the first time, this longstanding event was opened up to the entire chapter, both past and present. Standing, from left: Phil Eastin, Steve Holoway, Curt Boggs, Mark Landwehr, Wayne Richards, Nick Sengheiser, Ryan Holder, Eric Delaney, Wayne Richards. Bottom row: Jay Nicholson, Chris Westrich, Mike Pearson, Steve Turek. Gary is being cremated, and Ellen, his wife has made arrangements to have a visitation at Kutis on Gravois this Thursday, Dec. 29 from 5-8PM. The priest from Assumption will have a brief prayer service around 7-7:30 that evening, during the visitation. Ellen is requesting donations in Gary’s memory to the Kidney Foundation. His obituary will be in Wednesday’s Post Dispatch newspaper. Thanks again for everyone’s support towards this program. I wanted to share a letter I received from Kim Hancock, the first recipient of the Colonel Edgar Baxter Award. Kim clearly went above and beyond to restore our 1940 Ford fire truck. The photo he is referring to is the one attached in my last email. Thanks again Kim and Congratulations on the Baxter award! Our Annual Meeting/Homecoming/Poker Night was held over the weekend. A tremendous success, and thanks to all for attending and contributing. The first ever Colonel Edgar Baxter award was presented to Kim Hancock for his efforts in restoring the fire truck. The Baxter award is our highest honor given out to an alumnus and will be presented when someone goes above and beyond the call of duty. An additional award was presented also and will be given out annually. To say it was a surprise is an understatement. It was/will be given for Outstanding Alumni Service, it is called the Jim Roebuck Award. There is still time for others to take part of the $105 early registration (after November 5th the cost is $135). Pike U is the best training available for our guys. Those interested in contributing to Mike’s challenge need to send a check-made out to Pi Kappa Alpha, memo line write ZX Pike U, for $105.00, send to me at 1638 S. Enterprise, Springfield, MO 65804 or do so online at Pikes.org. We made page 1 of the Ozarks section in the News Leader Sunday. The Fraternity awards have been posted online at www.Pikes.org. 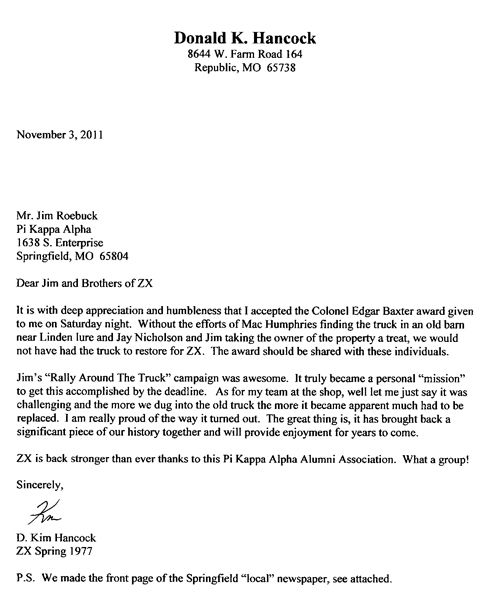 You should click the link below and see ZX listed as winner of the Nester Award for Outstanding Alumni Association for 2010-2011. http://www.pikes.org/AlumniAwards.aspx?mode=spage&spid=70&pid=6 This is very nice recognition for our Association. We all have to stop and smell the roses sometimes and this is one of those times for ZXAA. Many Alumni Associations exist with Pi Kappa Alpha, many are older and bigger. Only one in 2010-2011 can say they are the Nester Award winner by Pi Kappa Alpha. “Together We Can Achieve Great Things”. We did this for ZX by ZX. Congratulations to all of us-Zeta Chi alumni and the Zeta Chi Alumni Association (ZXAA). On July 30, 2011, nine of us attended Pike Academy in Memphis, TN and received the William R. Nester Alumni Association of the Year Award on behalf of ZXAA! This award is presented annually and recognizes “The Outstanding Alumni Association In The Fraternity for 2010-2011”. It is something all of us should be proud to receive. This is our second National Award, Zeta Chi Alumni Association also received the “Outstanding New Alumni Association” in 2006-2007. We no longer hope to compete with the big dogs, because this year WE are the big dog! Zeta Chi is a special group. The ZXAA intends to keep us together and promote alumni events and leadership for the ZX colony. Zeta Chi provided all of us unique and lasting memories. Supporting ZXAA as alumni with payment of your $50 annual dues will maintain our Association and allow us to continue activities established as the “Outstanding Alumni Association In The Fraternity”. The hope is everyone can attend our annual meeting each year, but if unable to do so, support ZXAA with your payment of annual dues. Payment options are: ZXAA Paypal link or sending me your $50 check made out to ZXAA, 1638 S. Enterprise, Springfield, MO 65804. Click here to view a listing of those current on 2011 dues. October 28-30, 2011, ZXAA will host our annual meeting/Homecoming/Poker Night event. All alumni are asked to mark their calendars and plan on attending. This will be the first time alumni and the ZX colony come together as one. All events will be held at the Oasis Hotel and Convention Center in Springfield, MO. Agenda: Friday night-welcoming reception in the Oasis Bar and Grill, Saturday-Homecoming parade aboard our newly restored 1940 Ford Firetruck, Bearfest Village Pre Game, MSU Football game and Saturday night Poker Night, Sunday-departure. Rooms have been reserved under ZXAA. Formal invitations are being prepared and will be sent to all alumni listed in the directory at www.zetachipikes.com. If you have changed addresses or have only an email listed you should go to our site and update “Are You Alumni”. Colony members have returned and they are off to a great start. Everyone is looking forward to a big RUSH to complement our numbers. They are an amazing group of young men, and well deserving to become ZX Pikes! Emails and Facebook messages will be coming as Homecoming nears. Again, congratulations to all for being a part of the “Outstanding Alumni Association In The Fraternity in 2010-2011”. 1.) ZXAA has been successful because of the alumni. In order for us-ZXAA-to function with annual meetings, after hours, web site communications, planning, fire truck maintenance, printing and postage for alumni communications, etc. we need alumni to pay their annual dues of $50. ZXAA has made a point of not asking alumni for money except for annual dues and “Rally Around the Truck” campaign. As of 2011, 56 alumni have paid their $50 annual dues, out of 250+ in the directory. This needs to improve, our checkbook balance needs to be refreshed. It costs money to do the things we have done. We have many achievements to celebrate. Returning ZX to MSU, restoring and maintaining the fire truck are just two. Everyone listed in the directory with email has received a $50 dues invoice. Once you pay you annual dues you are removed from the list for that year. If not, you continue to receive an invoice. We need you to pay up, ZX is worth $50 a year. There are expenses involved with running a successful Association. The energy spent collecting dues takes away from more productive events for the Association, and truthfully is getting old. Click here to visit our Pay Pal Page. 3.) 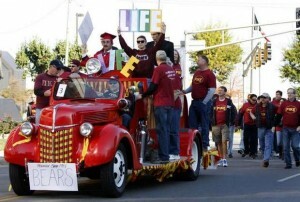 Missouri State Homecoming is October 28-30, 2011. ZXAA will be hosting a alumni/colony weekend event. Details are close to final. This will be the first time alumni and the new 75 man colony will be together. The weekend is geared around MSU homecoming events-parade, Bearfest Village, game, and ZX Saturday Poker Night at the Oasis. Formal invitations will be sent out and email notifications also. If your contact information has changed in our directory please update it at www.zetachipikes.com. Thanks for all you do, alumni have led the way and made the difference. Together our efforts won us a Nester Award-Outstanding Alumni Association. Send you dues guys, ZXAA needs the money! Posted in News | Comments Off on 3 Things!